Twenty-five years ago, the so-called New Democrats were triumphant. Today, their political heirs are eager to prevent the Democratic Party from living up to its name. At stake is whether democracy will have a chance to function. A fundamental battle for democracy is in progress—a conflict over whether to reduce the number of superdelegates to the party’s national convention in 2020, or maybe even eliminate them entirely. That struggle is set to reach a threshold at a party committee meeting next week and then be decided by the full Democratic National Committee before the end of this summer. To understand the Democratic Party’s current internal battle lines and what’s at stake, it’s important to know how we got here. After a dozen years of awful Republican presidencies, Bill Clinton and running mate Al Gore proved to be just the ticket for the corporate wing of the Democratic Party. 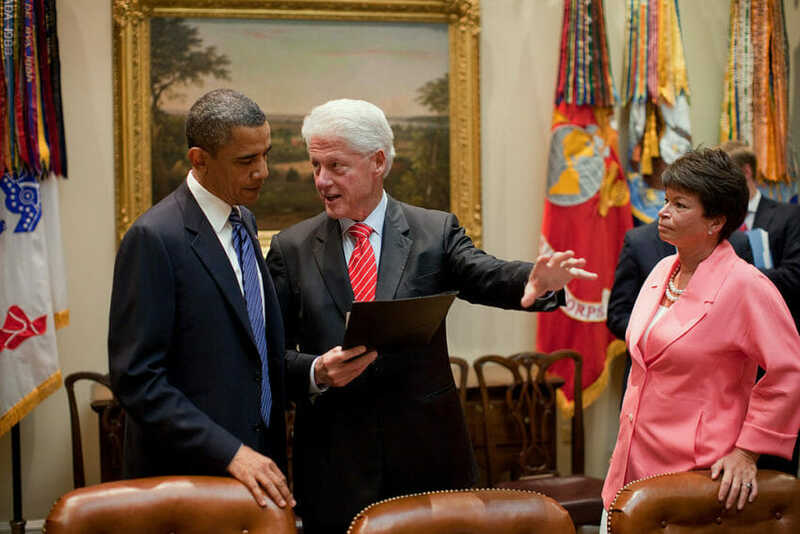 Clinton settled into the White House in early 1993 as the leader of pathbreaking New Democrats. Many media outlets hailed him as a visionary who had overcome left-leaning liberalism to set the party straight. Although candidate Clinton had criticized Republican trickle-down economics and spoken about the need for public investment by the federal government, as president he proceeded along the lines of what Washington Post economics reporter Hobart Rowan described as a formula of “fiscal conservatism and social liberalism.” That formula provided a template that the next Democratic president, Barack Obama, deftly filled. Both Clinton and Obama were youthful and articulate, breaths of fresh air after repugnant Republican predecessors in the White House. Yet our two most recent Democratic presidents were down with corporate power—not as far down as the GOP, but nevertheless in the thrall of Wall Street and the big banks. From the outset of the Clinton and Obama administrations, top appointees reflected and propelled the deference to oligarchic power. Robert Rubin went from being co-chair of Goldman Sachs (paid $17 million in 1992) to serving wealthy interests as director of Clinton’s National Economic Council, a post so powerful that it earned him the title of “economic czar.” Two years later, Rubin began a long stint as secretary of the treasury, succeeding former Texas senator and big-business tool Lloyd Bentsen. They were just two of the numerous corporate functionaries in the upper realms of the Clinton administration. While that kind of lineup went over big with moneyed interests, its policy pursuits would end up driving a wedge between the Democratic Party and the working class. Of course the guys driving Clinton’s economic train loved the North American Free Trade Agreement. Why wouldn’t they? Workers were costs, not people. Corporate trade deals were profit boosters. Weeks after pushing NAFTA through Congress with an alliance of Republicans and corporate-friendly Democrats, Clinton signed the trade pact in December 1993—a move that was unpopular with working-class voters across the political spectrum. A year later, Republicans gained control of the House of Representatives, a GOP grip over the body that went uninterrupted for 12 years. During his first term, Clinton’s signature accomplishments to serve economic elites went beyond NAFTA to include the landmark Telecommunications Act of 1996. That same year, riding a wave that included ample undertows of misogyny and racism, Clinton celebrated his signing of the welfare “reform” bill into law. The legislation created a gold rush for media conglomerates to gobble up broadcast stations, while low-income women found their financial plights becoming even more dire. Heartbroken over the new welfare law, one of the lone holdouts against the corporate sensibilities in the Clinton Cabinet, Labor Secretary Robert Reich, exited as the first term ended. Meanwhile, Clinton doubled down on selecting an intensely corporate crew for the administration. “The firm—er, team—is still adding partners—er, members,” Time reported in December 1996, cataloging the array of investment bankers, stock-market-friendly lawyers and wealthy financiers who had reached key posts. The newcomers “are don’t-rock-the-boat appointments, and they are exactly what Wall Street wants,” a senior economist at an investment banking firm told the magazine. During the last years of his presidency, Clinton’s economic team implemented reckless Wall Street deregulation, paving the way for the financial meltdown of 2007-2008. The political similarities between how Presidents Clinton and Obama behaved in office—and the electoral disasters that ensued for Democrats—are grimly acute. Only two years into their service to corporate America as presidents, the bottom fell out of support from the Democratic base to such an extent that in both instances the Democrats lost control of Congress. Arriving in the Oval Office while a huge financial crisis threatened the homes of millions, Obama proceeded to bail out the big banks, offering little help to people whose houses were “under water” and who faced foreclosures. In fact, profiteering from the 2008 housing implosion was in keeping with what helped make Obama’s election to the presidency possible. In 2007, his campaign was lubricated by bountiful donations from the biggest Wall Street investment banks. And more than anyone else, his financial patron in the quest for the White House was Penny Pritzker, a billionaire real estate magnate who profited handsomely from the 2008 subprime mortgage disaster that befell so many low- and moderate-income Americans, a large proportion of them people of color. In 2013, Obama made Pritzker the secretary of commerce, a position she held through the end of his presidency. Of all the people to choose for that Cabinet role, he selected someone with an estimated wealth of more than $2 billion who just happened to be the most important financial backer of his political career. After his re-election, Obama lost interest in the Democratic National Committee, leaving its finances in shambles by the time the 2016 election rolled around. And, as measured by votes, the Democratic base eroded nationwide. During Obama’s eight years in office, his party lost about 1,000 seats in state legislatures. Now, the New Democrats and those walking in their footsteps are battling to retain control of the national party. This year’s midterm election campaign has seen lots of intervention efforts by the Democratic Congressional Campaign Committee, favoring establishment candidates over progressive opponents in party primaries from California to Texas to Pennsylvania. Days ago—after the release of a secretly recorded audio tape that exposed how House Minority Whip Steny Hoyer tried to pressure a progressive congressional candidate to pull out of a race in Colorado—House Minority Leader Nancy Pelosi defended Hoyer at a news conference. Later this year, as the 2020 election grows larger on the horizon, the DNC will make decisions about party rules with major effects on the race for the presidential nomination. Insiders who don’t want to democratize the Democratic Party are weighing their options. Consider, for instance, a long-standing New Democrat named Elaine Kamarck. She’s one of only a few people (all of them Clinton 2016 primary supporters) on both the DNC’s Unity Reform Commission and its powerful Rules and Bylaws Committee—which will meet in Washington next week to vote on such matters as superdelegates to the 2020 Democratic National Convention. In her role on the Rules and Bylaws Committee, Kamarck is part of the process that could end up—as recommended by the party’s Unity Reform Commission that included Clintonites and progressives—eliminating 60 percent of the existing 712 superdelegates (more than one-seventh of the total) in time for the 2020 national convention. The distorting and undemocratic impacts of superdelegates have gone way beyond their numbers. By November 2015, Hillary Clinton had already gained public commitments of support from 50 percent of all the superdelegates—fully 11 weeks before any voter had cast a ballot in a state caucus or primary election. Such a front-loaded delegate count, made possible by high-ranking party officials who are superdelegates, can give enormous early momentum to an establishment candidate. Many Democrats are eager to substantially reduce or eliminate superdelegates as antithetical to democracy. But Kamarck has quite a different agenda. She doesn’t want to get rid of superdelegates. In fact, she’d like more of them. Such an agenda is best served in the long run by choking off democracy as much as possible, lest the riffraff get away with undermining the ruling elites. “Kamarck has backed the original Unity Reform Commission proposal, but also made clear that she believes that, in the long term, more so-called peer review by veteran party leaders produces stronger presidential nominees,” BuzzFeed reported in April. Let’s face it: Democracy is dangerous to the powerful who rely on big money, institutional leverage and mass media to work their will. The insurgencies of this decade against economic injustice—embodied in the Occupy movement and then Bernie Sanders’ presidential campaign—are potentially dire threats to the established unjust order. For those determined to retain their positions in the upper reaches of the Democratic Party hierarchy, democracy within the party sounds truly scary. And inauthenticity of the party—and its corresponding heavy losses of seats from state legislatures to Capitol Hill during the last 10 years—don’t seem nearly as worrisome to Democratic elites as the prospect that upsurges of grass-roots activities might remove them from their privileged quarters.